Nouakchott (AFP)-- Mauritanians voted on Saturday in nationwide elections overshadowed by a widespread boycott of opposition parties, with all eyes on the performance of an Islamist party allowed to take part for the first time. The mainly-Muslim republic, a former French colony on the west coast of the Sahara desert, is seen as strategically important in the fight against al-Qaeda-linked groups within its own borders, as well in neighbouring Mali and across Africa's Sahel region. "I think these elections today are a victory for democracy in my country," President Mohamed Ould Abdel Aziz said after visiting his local polling station in Nouakchott. 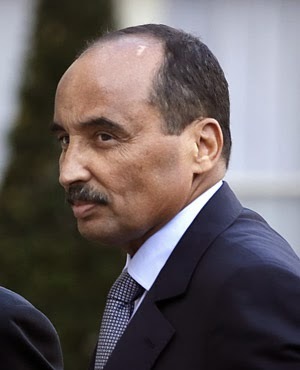 Around a third of Mauritania's 3.4 million people are eligible to vote in the first parliamentary and local polls since 2006, a test of strength for Abdel Aziz five years after he came to power in a coup and four years after he won a widely contested presidential vote. His Union for the Republic (UPR) is expected to retain power but opinion is divided over whether the main Islamist party Tewassoul, only legalised in 2007, will provide a serious challenge to the favourites sink back into obscurity following the election. Some 1 500 candidates from 74 parties representing the administration and the so-called "moderate" opposition are registered to vie for 147 seats in parliament and the leadership of 218 local councils dotted across the shifting sands of the vast nation. The process of voting appeared more complicated and arduous than had been expected and long queues began to build up outside polling stations in the capital. Voters, most of whom are illiterate, faced the difficult task of finding the symbol for their party among several electoral lists covering parliamentary and council seats. Towards the end of the morning many stations were tripling the number of booths available for casting ballots. "I came in the early morning, I have just voted. There was a long wait but I have done my duty," said an elderly woman at a Nouakchott polling station. Party activists near several polling stations discreetly tried to canvas last-minute support, breaking election law. "I know propaganda is forbidden near polling stations on election day, but everyone is doing," said a campaigner called Rabia when challenged by a journalist. Tewassoul is the only member of the so-called "radical" opposition, the 11-party Co-ordination of Democratic Opposition (COD), contesting the polls after its coalition partners said they would "boycott this electoral masquerade". The party, associated with the Muslim Brotherhood, professes to hold more moderate beliefs than the country's jihadist fringe and draws support from female voters and Mauritania's young, urban middle-class -- although it has just four seats in parliament. It describes its participation as a form of struggle against the "dictatorship" of Abdel Aziz. Party leader Jemil Ould Mansour complained of rule-breaking in the voting process after casting his ballot. "I note that deficiencies have been observed by our members, including a campaign inside a polling station by its manager in favour of one particular party and the refusal in some places to let our representatives into polling stations," he said. The UPR is the only party fielding candidates in every constituency, making it a strong favourite over Tewassoul, its closest rival, and the People's Progressive Alliance of parliament leader Messaoud Ould Boulkheir. "I hope that this election will end the political stalemate that exists and I think the door of dialogue should remain open to achieve this," Ould Boulkheir said. Following independence from France and the ensuing one-party government of Moktar Ould Daddah, deposed in 1978, Mauritania had a series of military rulers until its first multi-party election in 1992. Abdel Aziz seized power in a 2008 coup and was elected a year later, but the COD has never accepted his rule as legitimate and demanded he make way for a neutral leader to administer the vote. "We made the necessary effort to ensure that everyone could participate in these elections but, unfortunately, not all the parties were involved," the president said after casting his ballot. "I think, unfortunately for them, they missed an opportunity, an important date, because they find themselves in a situation where they will be absent from the National Assembly and therefore the political debate."